To the surprise of many in the European Parliament, President Jean-Claude Juncker did not speak of Italy where a populist government leads proceedings since a few months. 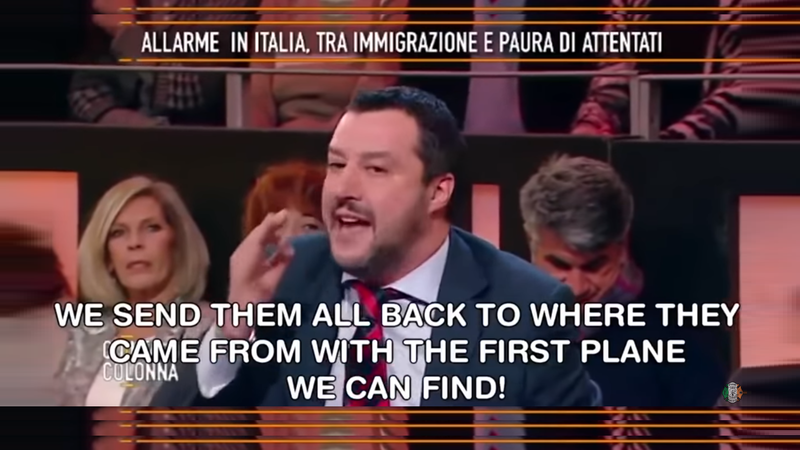 Italian Interior Minister Mr. Matteo Salvini, therefore, made sure that he dominated TV highlights in the evening again by going on another talk show up against defendants of immigration. To great applause from the crowds, the most popular politician in Italy made it clear that when it comes to the topic of immigrants “we need to send them all back with the first plane we can find. We can’t fill Italy with Africa”. Meanwhile, the prosecutor who had placed Mr. Salvini under investigation over the illegal detention of migrants (on the Diciotti ship, see our related coverage) has received a death threat in the form of an envelope in his office’s postal box this morning carrying a note and a bullet. Related coverage: <a href="https://thegoldwater.com/news/35169-Italy-Migrant-Ship-Row-Judge-Orders-Salvini-To-Release-Kidnapped-Refugees"> Italy Migrant Ship Row – Judge Orders Salvini To Release ‘Kidnapped’ Refugees</a>. The stamp on the envelope carried the symbol of a Gladius sword, a mark which is often used by military groups close to far-right movements. Mr. Salvini is currently, by all accounts, the most popular politician in Italy still. His government of the populist parties Lega Nord and Five Star Movement would easily gain a 60% majority if elections were held this weekend.